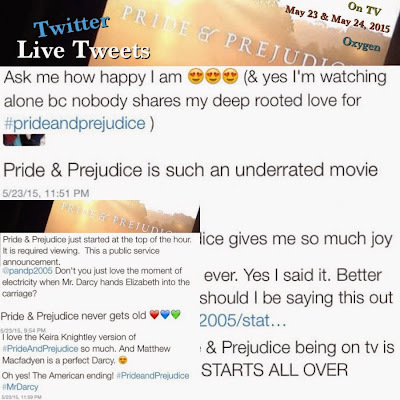 Pride & Prejudice (2005) Fan Blog celebrates 8 Years Online! 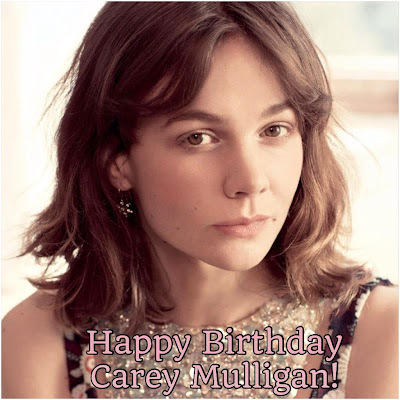 Today (May 28th), is the 30th birthday of Academy Award Nominee (and BAFTA award winner for Best Actress in An Education) and Tony Award nominee (for current Broadway play Skylight as Kyra Hollis), Carey Mulligan, best known to us, P&P movie fans, as Kitty Bennet (and also as Isabella Thorpe inNorthanger Abbey)! 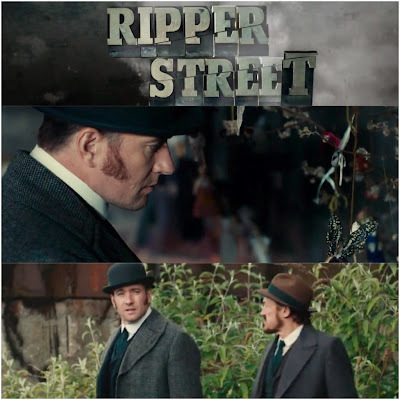 Tonight the third season of BBC America's crime mini-seriesRipper Streetstarring Matthew Macfadyen (as Detective Inspector Edmund Reid) continues with Episode 5 at 10/9c. Jerome Flynn, and Adam Rothenbergalso star. Episode 5 | Original Air Date: 27 May, 2015 A destructive gang of youths unleash hell upon the streets. 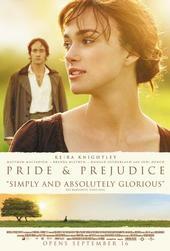 Last night's back-to-back airing of Joe Wright's 2005Pride & Prejudice movie starring Keira Knightley & Matthew Macfadyen on TV on Oxygen channel got me super excited as It's been a while since it was showing on TV. I love watching this movie on TV even though I've seen it countless times, I own a few copies of it on DVDs and Blu-Ray, and I don't like those annoying commercials that goes with it. 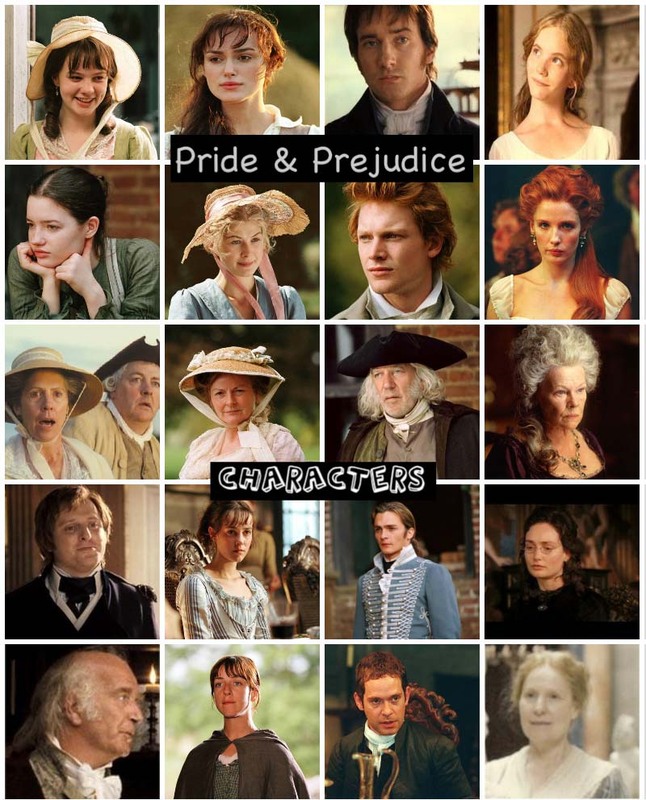 But because this 2005 version of P&P is my all-time favorite movie, I can't help but watch this movie (over and over) again whenever it's on TV. Well, what can I say, this movie just never gets old in my viewing (no matter how many times I've seen it in almost a decade now and I know I wasn't the only one). The Prosecution of Mr. Darcy's Cousin - a new Pride and Prejudice mystery novel by Regina Jeffers coming June 16th! 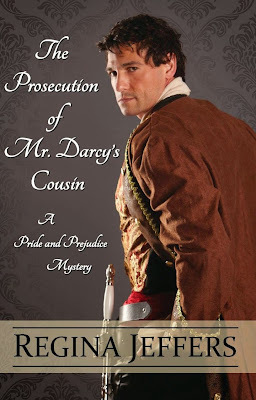 One of this blog's guest bloggers/contributors, Regina Jeffers, is releasing a new Pride and Prejudicemystery novel titled The Prosecution of Mr. Darcy's Cousin. The novel will be released by Pegasus Books next month, June 16th. 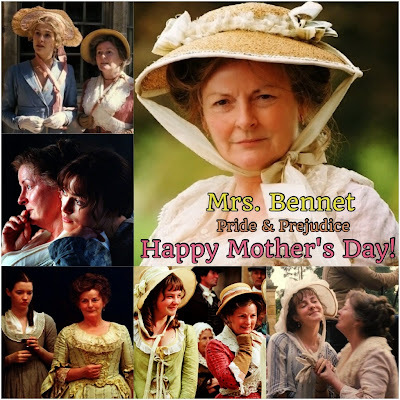 Recently, she released two other P&P related titles: Elizabeth Bennet's Deception and Mr. Darcy's Fault. 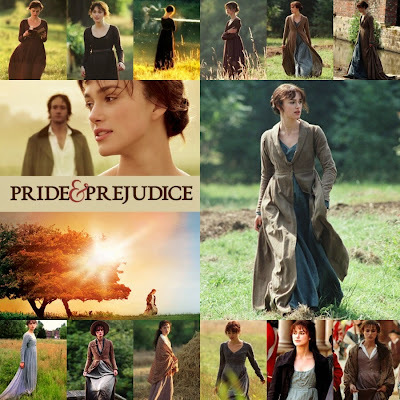 It’s hard for me not to think of Pride & Prejudice (2005) and not think of how the cinematography, particularly the scenes of nature influence my enjoyment of this film.The imagery is lush and the locations are sumptuous. 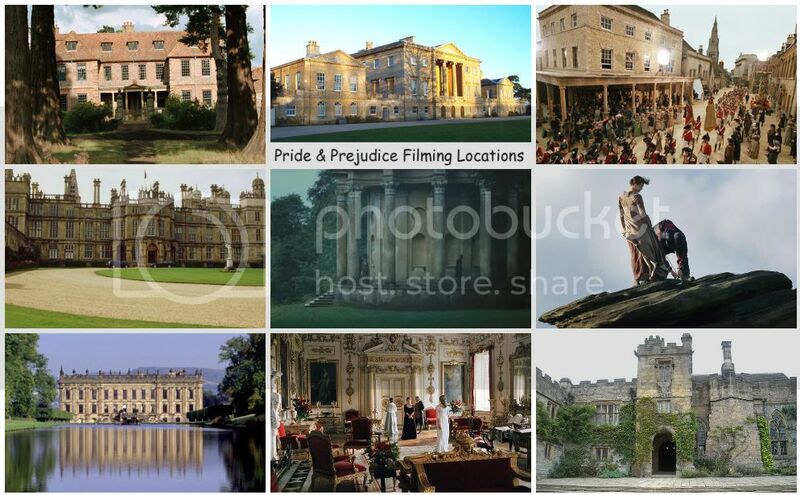 After all, what is a Jane Austen adaptation without landscapes playing a major role? The influence of her garden and the surrounding fields of the English terrain are evident in her writing of the outdoors. Tonight the third season of BBC America's crime mini-seriesRipper Streetstarring Matthew Macfadyen (as Detective Inspector Edmund Reid) continues with Episode 4 at 10/9c. Jerome Flynn, and Adam Rothenbergalso star. 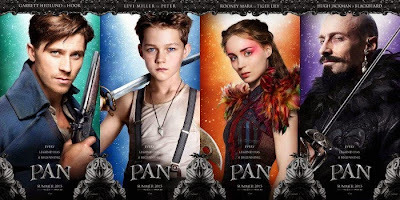 As I previously posted here last April, Joe Wright's new fantastical origin Pan film starring Hugh Jackman, Rooney Mara, Amanda Seyfried, Garrett Hedlund, and Levi Miller, has been pushed back from July 24th to October 9th. 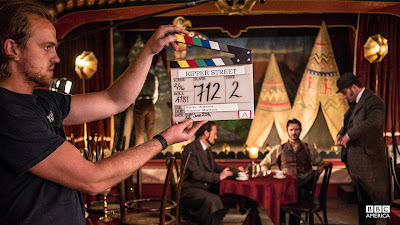 Several new on set (Season 3)and behind the scenes cast photos of BBC America's crime mini-seriesRipper Streetstarring Matthew Macfadyen (as Detective Inspector Edmund Reid) has been added to BBC America's site for Ripper Street featuring some Matthew images on set. The series continues with Episode 4 this week on Wednesday (May 20th) at 10/9c. Jerome Flynn, and Adam Rothenbergalso star. Watch: Jena Malone in trailer and clips for 'Angelica' film; plus movie poster and stills! Jena Malone's upcoming Supernatural thriller film, Angelica premiered at Berlin International Film Festival last February 7th and a 45 seconds teaser trailer (via THR) and 4 clips (via Film Divider) had been released online as well as a poster and a few promo stills. Ed Stoppard and Janet McTeer also star. No U.S. theatrical release date yet has been announced. Amazon Prime orders two more Seasons of Ripper Street starring Matthew Macfadyen! Two more seasons for Ripper Street!! Wohooo!!! What a great news (as I'm a big RS fan and have been watching this series and live-tweeting on twitter almost every episode since Season 1, this is exciting news) to wake up to this morning! 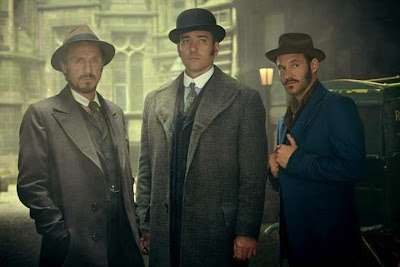 Even better, not one, but two more seasons and this news comes on Episode (3) day of the third season of BBC America's crime mini-seriesRipper Streetstarring Matthew Macfadyen, Jerome Flynn, and Adam Rothenberg! According to Radio Times, RS has been awarded two more seasons by UK's on-demand online streaming siteAmazon Instant Video. Hopefully, Matthew (he seems "delighted" on his statement, which you can read below of his show's two more seasons renewal news) and his co-stars since S1 returns for the upcoming two Seasons. Filming for Season 4 starts soon! 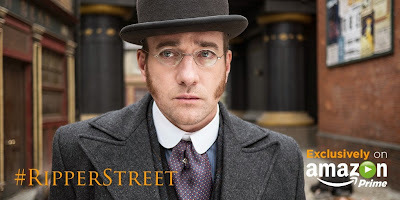 Tonight the third season of BBC America's crime mini-seriesRipper Streetstarring Matthew Macfadyen (as Detective Inspector Edmund Reid) continues with Episode 3 at 10/9c. Jerome Flynn, and Adam Rothenbergalso star. Episode 3 | Original AirDate:13 May, 2015 Chief Inspector Abberline asks Drake to take over the helm of H Division. 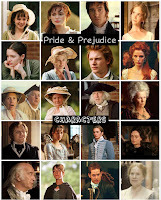 Keira Knightley's Pride & Prejudice connection with a few Matthews, a Rupert Friend, a Tom Mison, and a Colin Firth! 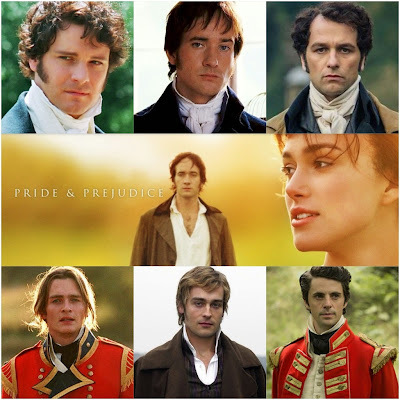 A few handsome Darcys, a couple Wickhams, and a Bingley, please?! Wow, the lovely Talulah Riley(akaPride & Prejudice's very own Mary Bennet)is looking radiant in red at last night's BAFTA TV Awards 2015 red carpet arrival. The gorgeous Miss Riley attended the House of Fraser British Academy Television Awards at Theatre Royal on May 10, 2015 in London, England. 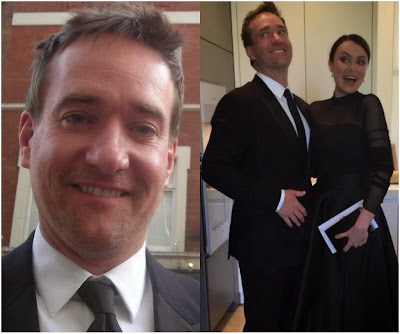 Matthew Macfadyen took a break from filming The Trapp Family movie and attended the BAFTA TV Awards 2015 last night with his wife,BAFTA TV Award nominee Keeley Hawes (Leading Actress 2015 for Line of Duty). Unfortunately, Mrs. Macfadyen lost to Georgiana Campbell. Also, Matthew's former P&P/AHH/Enigma/MB co-star Tom Hollanderdidn't win either on his Male Performance in a Comedy Programme 2015 for his award winning comedy series Rev. See full BAFTA TV Awards 2015 Winners here. To my Mom and all the Mothers around the world! We love you and appreciate you!!! Movie Casting News: Rosamund Pike in talks to star with David Oyelowo in 'A United Kingdom' film! More movie projects (this is the 7th one with other titles already lined up:HHHH, The Spark,The Deep Blue Good-by with Christian Bale, The Mountain Between Us, and The Bends. Plus the long in-development French Window) is lining up for on-demand Oscar Nominee Gone Girl's Rosamund Pike (photo by Getty Images with David Oyelowo at Jack Reacher premiere and press interview image via movieweb), as another movie in the works, A United Kingdom, which she is currently in talks and considering signing on to and join fellow Oscar Nominee Selma's David Oyelowo (who previously co-starred with Ros in 2012's Jack Reacher with Tom Cruise). The film is based on a true story of Prince Seretse Khama of Bostwana, who caused an international scandal when he married Ruth Williams, a white woman from London in 1940s. This looks interesting, I hope Ros signs on for this movie. If she does, I'm sure she'll be playing the female lead Ruth Williams. This past Tuesday, I posted the first trailer for Return To Sender here. 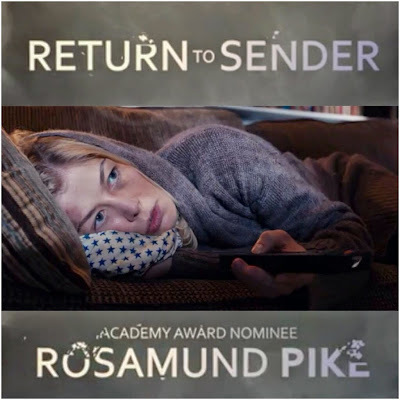 With the independent film getting a UK Cinema release first on the 22nd of this month, now comes the news that Rosamund Pike's psychological thriller Return To Sender has just been acquired in the U.S. by Image Entertainment. No U.S. release date has been set as of yet, but it looks like it might be released sometime by the end of this year 2015. Shiloh Fernandez, Nick Nolte, Rumer Willis, Camryn Manheim, Illeana Douglas, and Scout Taylor-Compton also star. 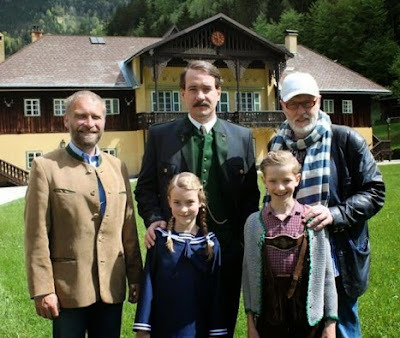 As filming for Matthew Macfadyen's upcoming film The Trapp Family: A Life of Music is underway with director Ben Verbong and co-stars Yvonne Catterfeld, Eliza Bennett, and the rest of the Trapp familyin Austria, a new on set photo ^ featuring Matthew with director Ben Verbong and I think two of the youngest Von Trapp kids (photo credit: Egelseder) emerged via Tips. The cast and crew moved to another location last week for more filming of the movie. I think they (cast and crew) are currently on break, or at least MM's co-star Miss Bennett is, as she mentioned on her Instagram last April 30th that she's back in England and is still there. The new Tips article has some new filming info. Update: More new filming in Austria and on set photos of The Trapp Family movie including a couple new on set/BTS photos with Matthew and director Ben Verbong. Scroll down this post to see them. Another new movie project for Rosamund Pike(photo collage: Getty Images), it's a World War II - Nazi drama and the title's interesting,HHHH. 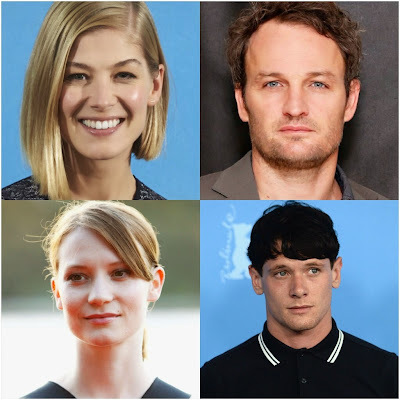 She joins Jason Clarke (who plays Keira Knightley's husband in the upcoming Everestfilm and in a few films with Carey Mulligan in The Great Gatsby/Wall Street: MNS/Public Enemies) as ReinhardHeydrich whose character's wife Lina Heydrich will be played by Rosamund; Mia Wasikowska (who co-starred with Judi Dench and Tamzin Merchant in Jane Eyre); and Jack O'Connell (who co-starred with Rupert Friend inStarred-Upand with Talulah Riley in The Liability). Jack Reynor (he co-stars with Tom Hollander in the upcomingJungle Book: Origins) also co-star. 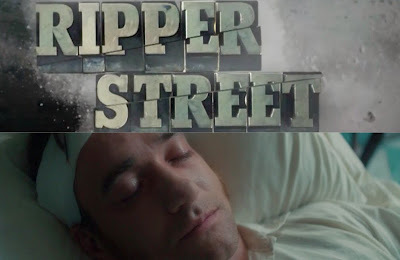 Tonight the third season of BBC America's crime mini-seriesRipper Streetstarring Matthew Macfadyen (as Detective Inspector Edmund Reid) continues with Episode 2 at 10/9c. Jerome Flynn, and Adam Rothenbergalso star. 2 | Original Air Date: 6 May, 2015 A routine murder inquiry in a curiosity shop reveals a secret underground cell. A trailer has been released via Digital Spy for the upcoming psychological thriller Return To Sender starring Rosamund Pike (hmm, looks like she was already in a bit of Amazing Amy mode in some random scenes in this trailer...though this film was filmed and completed before her Oscar nominated film Gone Girl was...), Shiloh Fernandez, Nick Nolte, Rumer Willis, Camryn Manheim, Illeana Douglas, and Scout Taylor-Compton. Rosamund stars as Miranda, a small town nurse who agrees to go on a blind date, but her mysterious suitor (Shiloh Fernandez) is not the person he says he is. 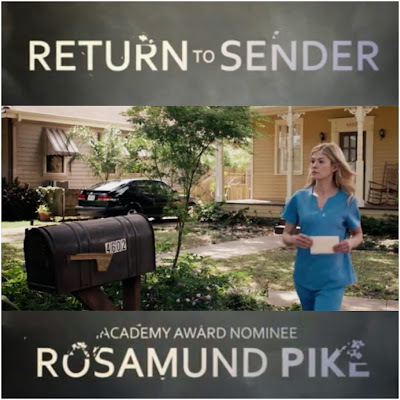 Return To Sender opens in UK Cinemas on May 22nd. No U.S. release date yet for this independent film. Carey Mulliganhasattended two very recent New York events. Sheattended the "China: Through The Looking Glass" Costume Institute Benefit Gala at the Metropolitan Museum of Art earlier tonight, May 4, 2015 in New York City. Also, Carey with her fellow Tony Award nominees and Skylight co-stars Bill Nighy and Matthew Beard attended The 2015 Tony Award Nominees Meet And Greet press conference and reception at the Paramount Hotel last April 29, 2015 in New York City. Photos|Videos: Watch Rosamund Pike on 'El Hormiguero' Spanish Show! Rosamund Pike(photo: Juan Naharro Gimenez/Getty Images Europe)just attended a photocall promoting her What We Did In Our Holiday 2014 film in Madrid yesterday and at the same day, she also appeared on El Hormiguero talk show (on Spanish TV) at Vertice Studio on April 30, 2015 in Madrid, Spain. You can watch Rosamund's El Hormiguero interview in full here (Note: you must sign up or subscribe to view the player). 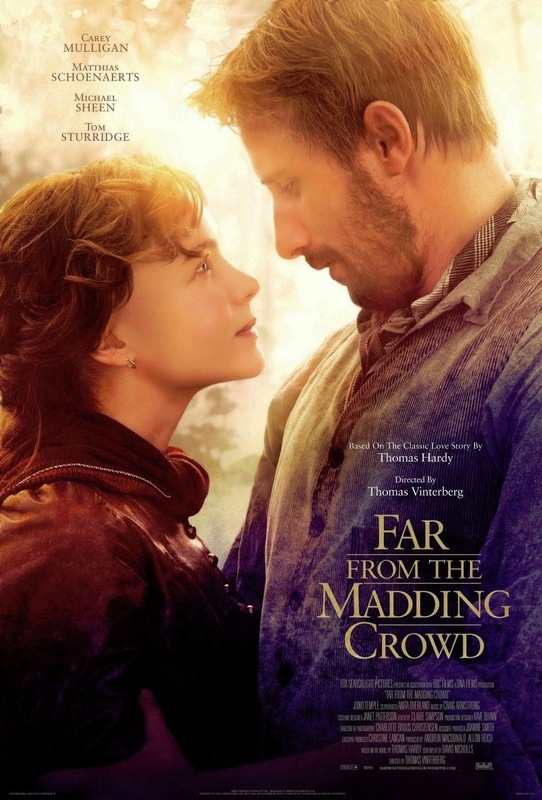 Now showing in UK Cinemas and select US Theaters is Fox Searchlight's new Thomas Hardy film adaptation of Far From The Madding Crowdstarring Carey Mulligan(Bathsheba Everdene). Matthias Shoenaerts, Tom Sturridge, Michael Sheen, and Juno Temple also star. 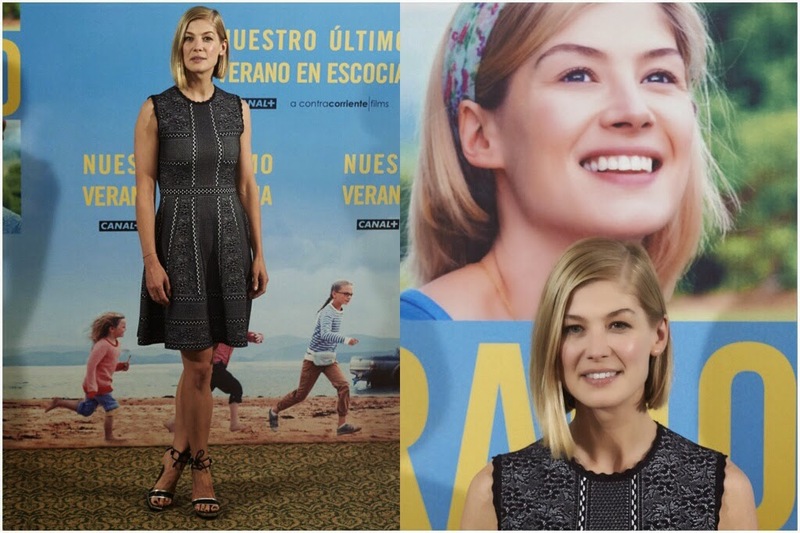 Rosamund Pikeattended her 2014 comedy film, What We Did On Our Holiday (Spanish title:Nuestro Ultimo Verano En Escocia) photocall at the Intercontinental Hotel on April 30, 2015 in Madrid, Spain. Unfortunately, this movie is not released here in the U.S. I would've love to have seen it. The trailer was hilarious. Guess, I'll just have to wait until it's added into Netflix, just like her other independent movies that were released only internationally. What We Did On Our Holiday opens in Spanish Cinemas May 29th!